This game is awesome, I hope that will be able to have a steam key on march 5th :) I will make a presentation on my youtube channel for my french community. Congrat ! Thank you! I just added a batch of Steam keys to the system. You can get yours by going to the download page and clicking "Get Steam key". The key can be activated already but the download on Steam won't work until the official release on Monday. Yes, the Steam and Itch versions are identical. Thanks for the notes! Yeah, the speedometers can be somewhat inaccurate but luckily the speed they show is usually a bit more than the actual speed, so you won't overspeed if you follow them. The route schema is that way by design so it wouldn't make things too easy. You should only use it to get an idea what is coming next and then look out of the window! :) Moving passengers are planned for one of the later updates. Please post a link to your video here or to the Steam community if you can, I'd love to watch the video once it's ready! Firstly I see DRS appearing on my 'coming soon' list on Steam - woot! Secondly - is there any way to see a map of the world that DRS is set-in? I like to have an idea of where I am/going - even if it's just a JPG - just so I can see where everything is in relation to everywhere else?? Also loving the new shader/style - tho it's had a bit of an effect on performance - new PC looms I guess!! Yes, DRS is finally coming to Steam! I'll arrange the keys for itch owners after the official release. The new version has a map button at the bottom of the service selection screen, did you notice? It's easy to miss though! There's no map during the actual run yet, this is planned for the next update. Motion blur is perhaps the single most demanding graphical effect. Does it help if you turn that off? You might also get better performance by using the second best quality option, but still enabling some of the additional effects, rather than using the best quality and disabling some effects. The sim is nowhere near fully optimised yet so hopefully you don't need to get any new hardware! Maps found - MUCH happier when I know where I'm going!! One small issue - the 'tutorial' function which suggests what to press seems to be less useful than it was in earlier releases? I'd disabled it for areas I was comfortable driving but I ran a scenario today which ended in a terminus and following the on-screen instructions led me to crash into the buffers! It also gets confused in some stations - you stop and it keeps suggesting you apply/release the brakes over and over? I'm ALMOST grown-out of it but I imagine new players may be confused? The key tutorial is the same as in the earlier version. It does occasionally instruct you to accelerate right before a terminus buffer stop so there's still room for improvement! For a funny example of this, see GrayStillPlays' Let's play video (he's playing version 1.0). The reason why the tutorial suggests fiddling with the brake at stations is because it's trying to match 15 inches of vacuum which is the standard for keeping the train still. The vacuum gauge works with some delay, especially in longer trains, which is why you see the needle dropping occasionally below 15in even though the brake valve is lapped. You're right though, it's confusing for a beginner and I'm still going to fine tune it in some of the future updates! It's super-useful to have that guide - esp as the game has the 'score' aspect for best driving practices!! Hey, congratulations for the launch of version 1.2, great improvements on atmosphere and sounds (they make it even more immersive now). I saw your post regarding the graphical effects on performance and wanted to add this from my findings: with "Good quality" preset and "Reflections" turned "off" I get fireflies on the edges of the passenger seats, sometimes with flashing white squares around them. Same effect is visible from the helicopter cameras and also on the incoming trains (from the opposite direction). Frame rate tanks a bit when I rotate my camera to look at them specifically (60 to 40-30). I'm attaching an image in case my description is lacking. Thanks! I've sometimes noticed the fireflys on my own machine as well, but not recently, so I thought the issue had somehow resolved itself, but apparently not. It's probably the bloom effect? There might some very small or degenerate triangles in the places where the fireflys occur, will need to investigate and come up with a fix to the next update. Did a test with "Bloom" setting "Off" and the artefacts are still there for me, maybe there are some inverted normals or overlaps in the mesh. LE: They go away if I turn High Dynamic Range "Off" when having Reflections disabled. Thanks, I tried the same and indeed, it's not the bloom. They also go away if I enable TAA or disable AO, so it must be a combination of the post effects and how they handle triangle or normal vector edge cases. I've only had Diesel Railcar Simulator for about 6 days and I have to say it is great and there is so much more to come as well. Really enjoying the physics modelling. Thanks Damo, I'm glad to hear you're enjoying the sim! Thank you very much for publishing your plans regarding updates for version 1 of DRS and announcing that those updates will be free is a very good news. I wouldn't change the order of the updates. Just carry on with your plans. Hey, thanks for your feedback! I'll proceed according to the plan. First I 'd to say that I'm really happy with my purchase the quality is really good for a game this early in development. It even does a few things better than the AAA sims on steam. Once I saw a few videos on the game, I needed to buy the game immediately. And I'm willing to support the game through the coming years. 1. On the Roadmap it says "Version 2 (2018-2019, new simulator, sold separately)" I would like some clarification on the "new sim" "sold seperately" part, does this mean we'll have to buy the game again once it hits version 2 or will it be a free upgrade for people who already bought the game at version 1.0? 2. I don't mind having my games on multiple platforms but is a steam release planned and if so will we receive a free steam key? Thanks a lot for making this amazing sim! I am looking forward to what it will become. 1. Yes, you'll need to buy v2 again as I'm considering it a "new sim" in that it has much broader scope and features, whereas v1 will be mainly limited to just British 1st generation DMUs. I'm still releasing several free updates to Diesel Railcar Simulator over this year and next year, and I'm sure they'll be worth your current investment. DRS owners will also get a discount from v2. 2. Steam release is indeed planned and keys will be distributed to those who bought the sim here! Thanks for answering so soon, it is now much more clear thanks and keep the good work up! Hello, I won this game in the RockPaperShotgun Foxer ( thank you for that ) and wanted to congratulate you on your awesome start with Diesel Railcar Simulator. I'm enjoying the realistic physics, bogie animations, cab movement, sounds and sense of speed. Immersion is very good, if not the best right now, a great mixture of simulation and friendly atmosphere. Hope you'll manage to develop this game further. - I would add a simple image tutorial in which signalling is described (for newcomers) at the start menu. You could create another button near the keyboard shortcuts and gfx options for this. - I noticed that some textures are glossy when they shouldn't be (bricks, seat, etc) this could affect game performance. - there are no line speed warning indicators before the actual speed reduction zone, from my knowledge rails have them in real life, so not having them in-game but penalizing for using the route feature helper does not make sense to me. - speed indicator signs are hard to see/read from a distance against ground colour/atmospheric lighting. - in some places (tight left curves) cab's left pillars block the vision of incoming signals. Hello! The next update will include more information on the signals and signs, but only in text. I do agree that pictures of the signals would be more helpful, and will consider them for the second or third update. Granted, the graphics are not very well thought out because I'm still learning things and wanted to focus on the physics and overall feel. Some of the future updates will bring improvements in this regard. There's also plenty of opportunities for optimisation in the graphics but also in other areas of the program. The seat material is shared with several other cab objects, so separating it would probably not help. In the modern railway there certainly are advance warnings to speed restrictions, but 1960's Britain, I'm not so sure. I'd be interested in knowing more about this from a reliable source. Maybe the drivers just had to rely on their memory and knowledge of the route. The limit signs were originally painted white, but being hard to spot in snow, were later converted to yellow. They currently don't stand out very well, I agree, maybe adjusting the overall illumination to a more realistic direction would help. 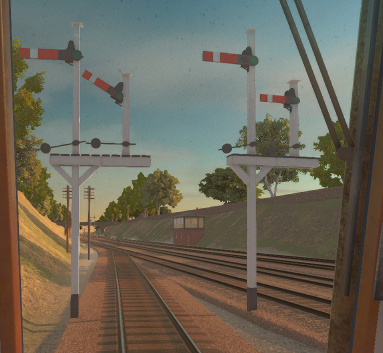 In the next update you can move around in the cab and stick your head through the side windows, so that'll help spotting the signals in tight corners. Looks like I was wrong, it appears that advance warning indicators for speed restriction segments were only introduced after 1971 and just in some places; acknowledging of the speed restricted areas is being left to the driver, either through learning the track or through time table documents (if there were any). Just bought the game and I love it, great work! Just a couple of questions. I was looking at the roadmap, and wandered if there were plans for a concept like scenarios in Train Simulator. The could really enrich the game by capturing situations that you can't timetable, like a reason blocking the track. Having an editor would also be good way to allow users who, when route editing comes out in the next version, don't have the knowledge to make a route, but still want to customise the game. It would also be great to see an image screenshot on the start page. Thanks! The next update will include a new mode (or scenario) called rescue, where the train has broken down and you need to bring it back to the depot. This mode will be automatically available for most services. Instead of manually creating these kind of scenarios, I'd prefer to generate them automatically for all services in the timetable. In addition, of course, it would be nice to enable users to create their own timetables and scenarios. The third update is planned to have a simple route and timetable editor, and I'll try to design it in a way that it's easy to learn and use. In your last sentence do you mean that you would prefer to use screenshots from the sim as background images in the user interface, instead of photos? The scenarios you describe would be possible to do automatically as well and I'm going to look into doing something like it in the future! The reason why I chose photos instead of screenshots was that the in-game graphics are not yet that good and because I wanted to make it clear to the users that these are real trains, not some product of my imagination. Screenshots are obviously much easier to create than finding suitably licensed relevant photos, so I'll probably start using screenshots in the user interface at some point. Thanks for the quick replies. The game is great and I look forward to following it as it evolves! Have you ever considered a Discord server? Never head of Discord before, looks like some kind of voice chat server? What is it used for? Hi, I've got a question re. the summary screen. On one of my less auspicious runs my summary included: Reckless driving (5 times), Max. comfortable acceleration exceeded (12 times), and Passenger comfort exceeded (2 times). The graph confirmed I had only sped once in a 10mph area, and I had stopped twice before the appropriate marker at one station, but other than that the lines didn't look too bad. Could you briefly explain what causes each of the above demerits? Cheers. Reckless driving is usually if you exceed the target speed by too much, for example when braking too late for a station. If you also brake too heavily, you might exceed the max comfortable acceleration (or, rather, deceleration) which I took to be 1m/s^2 according to some source. Exceeding passenger comfort means too abrupt change in the acceleration, most likely when coming to a halt after maximum braking. You can avoid this by releasing the brakes just before the train is about to stop. Bear in mind that the performance of the tread brakes on these trains varies according to speed. The brakes are more effective when the train is moving slowly. The violations are recorded every two seconds if I recall correctly, which explains the number of occurrences! The signal in your picture is cleared for the rightmost depot track, hence the semaphore arm on the right is pointing upwards. I'm preparing more instructions for the next update so the signals will be easier to understand. In addition there will be a new helper that displays the signal as green or red blob in the route minimap depending on whether you can pass it or not. In the meantime you can always access the helpers while running the sim by pressing ESC and going to the driving settings screen. If you temporarily enable the key helper, you'll get an idea of whether you should just accelerate past the signal or stay put. The sim should be able to handle without problem the case where you overrun a signal and then reverse back. Thanks for the reply. I'd like to say it does but after running the scenario some more times, both driving and watching (have I mentioned how useful that is? ), I must still be missing something obvious. Each time I come down the line the AWS horn sounds, the distant signal is at caution, and the stop signal is at danger. So I stop. But if I enable Show target speed while I'm sat there it shows 34mph... and if I'm watching the AI driver they reduce speed to ~34mph and sail right through. So my question this time is: how can one tell when one can pass a signal at danger? Is it something to do with it being a junction signal (assuming it is one)? BTW would you prefer I post any future questions in the trainsim.com Diesel Railcar Simulator thread? My questions seem mainly academic rather than DRS specific and others there can probably correct any further misunderstandings I have. Thanks for the purchase! Regarding the trainsim.com thread, feel free to post at either place. You'll probably get faster replies over there, but your posts here are useful for those who are not familiar with that thread. Thinking more closely about your question, I think someone else asked the same thing at the trainsim.com thread, and it was even the same signal! Here's the first page of that discussion on the thread. What isn't mentioned is the approach control: you get a caution from the distant and the actual signal remains at danger until the signalman is satisfied that you're not going to exceed the 25mph limit for the turnouts of the diverging route. Ok I'll keep posting here since I don't have an account on trainsim.com. I think I understand now where my confusion is coming from. I was taking the 4 semaphore gantry in the picture above to mean only a train on the 4th (rightmost) track had the clear signal and that my train, being on the third from left, had a danger signal. But I wasn't taking into consideration that signal poles (always?) appear to the left of the track they are relevant to. Given that, I now believe that the signal in the picture is telling me that the route I'm on is diverging to the right (the 4th track) and, given the height of the 3rd and 4th semaphores are identical, the speed limit is the same as my current one. Which leads me to another question (sorry!). The picture below shows what I'm calling, until told otherwise, a pair of merging signals. They seem backwards... why do the semaphores not correspond to the tracks? I.e. 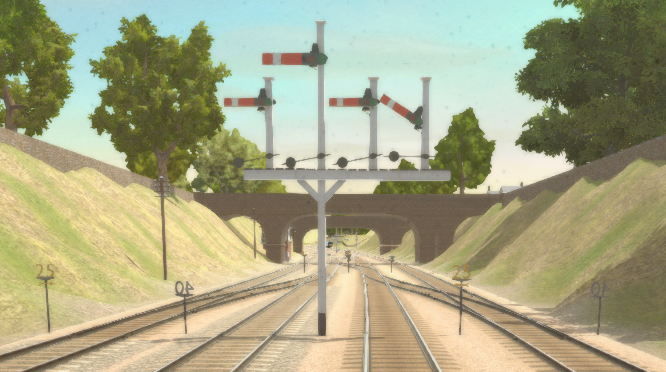 the leftmost semaphore is mounted on the taller pole which indicates it's the faster line... but the faster line is to the right of the train. The number of semaphores relates to the number of options you can be routed to from that signal onwards. In this case the tallest means the route "straight" along the leftmost track of the set of four main line tracks. The smaller semaphore indicates that you are clear to proceed and will be routed to the next "option" to right, which is the third main line track from the left. The "options" are the same for the signal on the right, i.e. when coming down that track. The reason why there are only two semaphores instead of four is that half of the main line tracks are designed to be run in the opposite direction, thus you won't ever be routed to them from this signal and therefore no semaphore is required for them. This is actually trickier to explain than I thought! Thanks for your comment! I'm improving the helpers and adding more information about the signals in the next update. For signals and signs this website is an excellent (and quite dense) resource. Please see sections 2, 13 and 21. Note that each section has multiple pages and you can access the next one from the bottom right corner (although for sections 13 and 21 the first page contains all the information relevant to the sim). For driving the trains, see the railcar website. Nothing beats this video though, if you have 20 minutes to spare! The startup procedure has been greatly simplified in the sim but the rest of the video is very useful. That video is great :-D ! Many thanks for the links, they help clear things up nicely. Keen to see the helper improvement you're adding in the next update as I got a bit overwhelmed when I had them on in non-simple mode: things popping up far too frequently for a relaxing time. Will there be a way to review the player's past run or runs for each service? I'm just thinking it would be nice to have access to all the end-of-run graphs and scoring breakdowns so the player can get an overview of their last run(s), areas that need improving and progress. I also noticed the AI's score replaced mine in the service list because it was higher (no surprise there). But will there be a way to display only the player's best score for a service? I like being able to watch the AI drive, and having a 'good' score to aim for and/or beat, but personally I would prefer to see only my scores listed (and have access to the AI's score for reference). It's sort of like inviting someone to play one of your games and they complete a perfect run and you're forever faced with their name on the highscore table. At the moment the scoreboard design is such that the AI scores indeed start filling up the board unless you can do better. I do understand your frustration with this and will try to come up with a solution in one the future updates. The AI's weak points are that it speeds sometimes and is not always very economical. You can often just run in a slightly more relaxed fashion to beat the score. Having the full evaluation saved for future reference would also be nice, along with a replay of the run! I can't yet say when these could be implemented, but they're on my list now. Thanks for the ideas! that it is not safe and removes it automatically. Just wondering if you have come across this problem before and is there a fix? Hi, this is the first time I hear about this kind of problem. Instead of downloading the zip, you could try installing the itch app and install the simulator from within the app. Please let me know how that works out for you. Thank you for your reply. Could you please let me know how to do this? If I use Itch, will I have to purchase the simulator again? You don't need to buy it again. Just install the itch app and log in to the app with your account. Then click on Library in the sidebar to the left. Here you should see the simulator with options to install it, or after it's been installed, to launch it. I'm sorry I can't quite remember what the app looks like before installing the sim. Another option would be to temporarily disable the anti-virus before downloading and extracting the zip. Or maybe the anti-virus has a quarantine where the zip is moved, and it could be recovered from there? Sorry for the trouble, I hope this helps! Hi, from the download email I saved the program to my Itch account. I was then able to find it in my Library as you advised and Install it and launch it no problem. Your quick replies are very much appreciated. I am really impressed with the level of realism you have accomplished with this simulator so far. Best wishes for your future plans, I am already looking forward to the updates. Cheers. Thanks! I'm glad to hear you got it working! Hi there. I bought this last week and have played it a little. I stream train/plane simulation games and plan to stream this tonight on Twitch from 7.30pm UK time. Really impressed with the work done so far and looking forward to seeing where this will go in the future. I'm definitely recommending this to my viewers. One question - the scoreboard - does this automatically take the name of the account on the PC? I'd like to be able to change this as I don't really want my full name displayed on stream. Hi! I hope I didn't miss your stream already. The scoreboard takes the current account name by default and you can only change it after it has already appeared on the screen, so it might be a bit of a problem for you. This is something that never occured to me, but I'll do something about it in the next update. The only workaround I can think of for now is to create another Windows account for streaming - sorry! I bought a copy of this several days ago and have been playing it ever since. Very, very impressive work - the moment a faster train overtook me as I trundled up a 4-track section was fantastically immersive. One teeny thing I would like to see (and I know that 'improved graphics' is on the todo list) is a 'toning down' of the colours, which are a little too bright/colourful/computer-generated (IMO!) at the moment. This really is an incredible achievement and I can only hope that enough people purchase a copy so that the phase 2 stage of development will go ahead as planned. Thanks! The colours may indeed be a bit over-saturated, I'll see what I can do about it in the next update. Nooooo it looks great as-is! :) IMO, the vibrancy of the colors works really well with the art style of the decor. If you make it more "realistic" looking, that'll draw attention to the stylistic approach of the scenery, and you won't gain anything. Keep as is, please, and focus on the actual content (routes etc), please! I will be buying this game in possible future! I want to ask if this is going to be a Railcar Simulator only? Or is it gonna develop to become a full fledged Train Simulation game with features as shunting, freight, passenger and other trains than just DMUs?? This version (1.x) is mostly going to be British railcars only, although one of the free updates will add a locomotive to demonstrate the possibilities. The next versions from v2 onwards will be more like a full featured trainsim, more about the plans here. I grabbed this after the RPS article, played it, and had to drop by to compliment the author. The fidelity is through the roof (after the sterility of TS) and I love how smoothly it runs. Also digging the "which key to press" feature which is actually teaching me how to run this train better than any other sim; I should be able to turn it off in another day or two! And having a "less than 25 minutes" (and other similar easy-to-use choices) in the route selector is just brilliant. Thanks, I'm sure it's possible to have both! I love the game so far keep up the good work! I bought this after seeing it on Rock Paper Shotgun and just ran a quick 15 minute route and this is pretty awesome. I love the feeling of movement in the cab, it feels so alive after Dovetail's pretty stale and motionless affairs. And the price is great! I'd love to have clickable cabs though... Also is there a route map available to download anywhere? Thanks for the feedback! The next update will include a route map. Clickable cab controls are on the todo-list but when they will be included is still uncertain. Are you selling early access game and then expecting people to buy the second version of the same early access game? Not exactly... Version 1, which is called "Diesel Railcar Simulator" is "early access" in the sense that I'm still going to release free updates (v1.x) to it which improve sounds, graphics and add a bit of content. Version 2 will be called something else since it's not only about BR diesel railcars but a more generic train sim. Version 2 will have a new name, much more content and features as listed in the future plans page. It will be sold separately because the new features will take so much effort and money (for outsourcing etc.) to develop that it wouldn't be sustainable otherwise. You can't expect to pay $15 and get several years of development and content for free. Compare to the other train sim products and their DLC. Oh, Okay. I was just checking since these days a lot of early access game developers just scam people and never finish their games. I have bought the game and at first I was afraid that it would be bad cuality an stuff but the game is awsome! I got way more than I was expecting. I love this game already! I would love to help creating this game but I don´t know anything about coding. Thanks! The coding side of things is all right at the moment, it's the graphics and 3d-models I could use help with. If anyone with graphics and modelling skills is reading, please e-mail me your contact details and a link to your portfolio. Looking around on your sites I have answered my own question about PayPal. Is it OK to buy the game with PayPal, I like what I see so far, I have been watching people play the game on YouTube. It looks a lot easier than other train games. If I buy it here will I get a steam key if it gets there And will I have all the future updates? Yes you get all the future v1.x free updates. If this game eventually gets to Steam I'll try to arrange it so that you also get the Steam key if you purchase it here (or have already purchased). Will this come out on Steam? And will it have controller support? It might come out on Steam once I improve the graphics and sounds a bit. The process to get on Steam is somewhat heavy and can take months (for a non-US seller). What kind of controllers do you mean? Raildriver might be supported some time in the future. How about looking into getting it on Humble Bundle store, as I believe they don't take a cut so big? Plus you can support charity (such as heritage railways) in the process! The cut here is quite low, so Humble store doesn't have much to offer in that regard. It would probably be more useful to eventually get the game on Steam. Thanks, yes, I've noticed that and for me as a dev it was certainly a positive change. To be more specific, the harder part seems to be preventing double taxation. Unless you can provide a US TIN, they will withhold an additional 30% of the sales, making it financially unsound. Apparently this isn't specific to Steam but to other app stores as well. From what I've gathered so far, getting a TIN isn't exactly straightforward for a non-resident foreigner. Please share if you have some experience on this! do u have an email for support? I know you already found it but it's support@railcarsimulator.com if someone else is looking for it. I'm going to buy this soon, but wondered if you plan to have your own forum or blog where you could post updates/news and take suggestions for possible future features? You're right, it would be a good idea. Right now my news and updates are scattered piecemeal all over the place. I'm opening a Facebook page soon, maybe a group as well. Does it have support for Raildriver? I'm afraid not, not yet at least, maybe in the future! I first need to order one for myself. Awesome train simulator, I'm really impressed. This simulator already has features that I haven't seen in a train simulator before, and it feels realistic too. Looking forward to the future releases. Thank you Lapioware! Thanks, it's going to get even better in the future! Wow this seems great what are your plans for future updates? Short term plans include a number of free updates until the next major version is ready. More about it here. Long term plans include new routes, trains a loads of other stuff. More about them here. Yes, I'm working on this alone and would welcome any help with 3D-models and graphics! what engine do you use to create ur models and graphics? Wow this looks amazing. I'm considering buying this game. I do have one question though: what are the graphic requirements? Thank you! The recommended system for highest quality graphics is a Windows PC with dual-core CPU, 4GB RAM, 600MB free disc space and GeForce GTX 750 or Radeon HD 6950 or comparable GPU, so the requirements are not very high! Top of my wishlist, it looks great! All we need is a class 101 or 105... but I'll still be buying soon! Thanks! The 112 should be fairly close to a 105.